Turkey and Bolivia aim to strengthen economic and diplomatic ties in the upcoming period Bolivian President Juan Evo Morales Ayma said on Tuesday, during his first-ever presidential visit to Turkey, stressing that the recent meeting in Ankara marks a turning point in bilateral ties. In an exclusive interview with the Daily Sabah, Morales said that he was honored to be in Turkey for the first time as the president of Bolivia and underlined that the aim of the visit was to further enhance bilateral ties in various fields. "We aim to revive economic ties between Bolivia and Turkey as well as expand the investment environment. This will be a new beginning for us," the Bolivian president said and added that Bolivia has been selling various products in Turkey including gold and chia and quinoa seeds. Morales, who was accompanied by a delegation of ministers during his visit, underlined that meetings for future trade agreements were going to be held. Following the meeting with Morales, President Recep Tayyip Erdoğan also underscored that the current trade figures were not enough to yield benefits for both countries and highlighted the necessity of finding new ways to expand bilateral trade. He pointed out that the bilateral trade volume grew by 250 percent in the last two decades. Turkey's exports to Bolivia were recorded at $21 million while imports stood at $92 million, according to data from the Turkish Statistical Institute (TurkStat). "Turkish Airlines is a world-renowned brand. There is a common expectation and desire for Turkish Airlines' direct flights to Bolivia," Morales said. As the geographical distance is considered an obstacle that impedes Turkish and Bolivian businesspeople from traveling frequently, the move might contribute to developing economic ties. In the joint declaration released after the bilateral meeting, it was stressed that the first meeting of the joint economic commission will be held within this year. Accordingly, both leaders agreed to immediately start negotiations for a deal to encourage and maintain mutual investments. Morales with Daily Sabah's Özgenur Sevinç. In relation to the ongoing efforts to open an embassy in Ankara, the Bolivian president said that "Turkey opened its embassy in Bolivia and appointed an ambassador. Similarly, we will also appoint our ambassador as soon as possible," and added that Bolivia and Turkey have high-level diplomatic ties. As Bolivia and Turkey will celebrate the 70th anniversary of diplomatic ties next year, Erdoğan and Morales expressed the common will to organize various events in 2020 for celebration. Morales said that Turkey is appreciated by the Bolivian people for its constructive approach and trade policies. He underlined that the Turkish nation is well-known in Bolivia. Touching on the impact of Turkish TV series in building cultural bridges with Latin American countries, Morales said that previously Mexican series were famous. "However, in recent years Turkish TV series have been widely watched and appreciated," Morales said. Commenting on the ongoing crisis in Venezuela, Bolivian President Morales stated that "first and foremost, when there is a disagreement in any country in the world, we believe that the problem should be resolved primarily by the people and authorities of that country through dialogue." He further added: "We reject intervention from outside." Morales also stated that "the government of Nicolas Maduro and the people of Venezuela want dialogue," and he added that there is some information that the opposition also wants to join the dialogue. "Yet, Donald Trump does not allow them to come together," Morales said. Venezuela was plunged into a political crisis in January when Juan Guaido, head of the opposition, declared himself interim president and was supported by the U.S. and dozens of other countries in January. The U.S. has imposed oil sanctions and other economic penalties on Venezuela in an attempt to force Venezuelan President Maduro out of power, but he has yet to show signs of backing down. Turkey, Russia and China support Maduro and have condemned the undemocratic means being used to end Maduro's term. 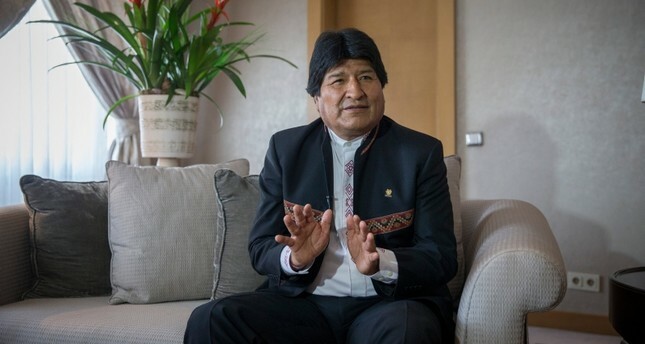 In relation to the upcoming elections in Bolivia, Morales said that for the last five years a number of social and economic plans were pursued and, according to the new government plan, the objective will be protecting and overseeing the rights of people in need. He pointed out that the poverty rate has been gradually reduced and underlined that their main goal is to continue reducing this rate with economic and social policies. "Until 2030, we will build 41 lithium plants," Morales said. He added that Bolivia will export some products such as chia, quinoa and coffee to China. Bolivia will also export energy to Argentina in the upcoming period.